The Mars Helicopter, a spacecraft with a meter-long rotor and a body the size of a chihuahua, will fly in the underbelly of the Mars 2020 rover. In five decades of exploring Mars, NASA has sent orbiters, landers and rovers to explore Earth's neighbor. But the space agency's next mission will be the first to send a tiny robotic helicopter to another planet. The Mars Helicopter, an autonomous spacecraft with a meter-long rotor and a body the size of a chihuahua, will fly in the underbelly of the Mars 2020 rover when it launches in two years, NASA announced Friday. The project will serve mainly as a test of the technology needed to fly a rotorcraft above a world 140 million miles away. It took four years of testing and redesign to create a helicopter capable of operating on the Red Planet. Mars's atmosphere is so thin that hovering just 10 feet above the surface is the equivalent of soaring 100,000 feet above Earth. The altitude record for helicopters on Earth is 40,000 feet; above that, the air isn't dense enough to hold copters aloft. "To make it fly at that low atmospheric density, we had to scrutinize everything, make it as light as possible while being as strong and as powerful as it can possibly be," Mimi Aung, the Mars Helicopter project manager at NASA's Jet Propulsion Laboratory, said in a news release. The helicopter is equipped with solar cells to charge its lithium batteries and an internal heating mechanism to keep it warm through the Martian night, when temperatures can plummet to minus 100 degrees Fahrenheit. It takes from about four minutes to almost as much as a half-hour for light to travel from Mars to Earth, depending on where the planets are in their orbits. That delay rules out the possibility of remotely operating the helicopter. Instead, the spacecraft must be able to receive commands from operators on Earth, then execute them on its own. The Mars 2020 spacecraft is slated to touch down on the Martian surface in February 2021. The car-size rover is equipped with a drill for collecting rock samples, instruments for conducting chemical analyses and seeking potentially habitable environments, an experiment to test the viability of producing oxygen from the planet's carbon dioxide-rich atmosphere, and an array of sensors. After landing, the rover will deposit its helicopter payload, then retreat to a safe distance while the rotorcraft take off. The helicopter's first flight should be a short one: It will climb 10 feet and hover for 30 seconds before returning to the ground. If all goes according to plan, the craft will make four more flights over the course of a 30-day test campaign, each progressively longer and more complex than the first. If the Mars Helicopter fails, the overall Mars 2020 mission will not be harmed. 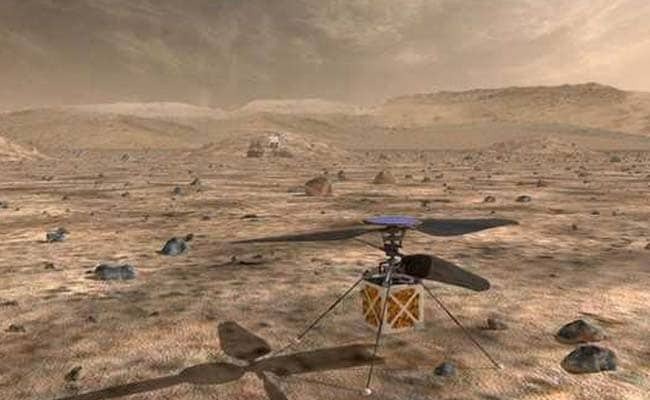 But the potential upsides for NASA are thrilling; a successful mission could pave the way for future rotorcraft to act as scouts and explore parts of Mars that rovers can't reach.